Three bottles of anointing oil from the Holy Land in favored scents of Frankincense; Myrrh, and Rose of Sharon; beautifully paired with shaded stained glass box with hinged lid. All three bottles, each with shiny goldtone top, will fit into the box for gift presentation and storage. Box is 2.75" x 3" x 2.25". Pure oil from the Holy Land. 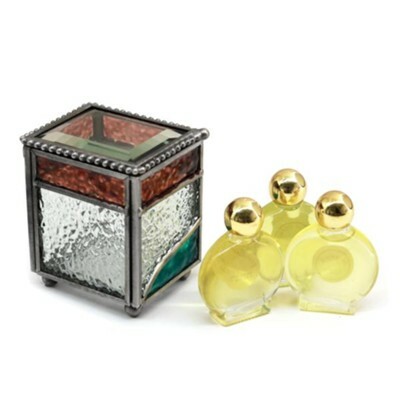 I'm the author/artist and I want to review Anointing Oil Set Orinamental Glass Box 3.